Used widely at top investment banks and financial institutions, the Premium Package has everything you need to master financial and valuation modeling. Learn financial statement modeling, DCF, Trading and Transaction Comps, M&A and LBO. Building on the knowledge gained from the financial statement modeling course, you will be introduced to valuation analysis in general, and the DCF model in particular. You will learn step-by-step DCF modeling, using the free cash flows already projected in the financial statement modeling case study. Along the way, you will learn how to estimate the weighted average cost of capital (WACC) in the real world, and build several commonly used approaches to calculating terminal value. Finally, we will use data tables to analyze a broad range of scenarios given different assumptions. Build an Accretion/Dilution (M&A) Model to reflect the pro forma impact of various Merger & Acquisition scenarios. Using a real case study, you will model out the acquisition of one company by another company, correctly incorporating pro forma balance sheet and income statement adjustments. Key topics covered include a quick test of accretion / dilution in all-stock deals, pricing structures (exchange ratios/collars/”walk-away” rights), purchase accounting, and the step-by-step allocation of purchase price. Leveraged buyout (LBO) modeling is used widely by investment banks and private equity firms and is often part of a finance interview. In this course, you will learn how to build a real, complex LBO model from scratch. You will start by learning about basic LBO concepts, typical deal structures, and current industry dynamics. You will then begin the step-by-step modeling, covering the most common and challenging issues that emerge when modeling buyouts. The course concludes with a sensitivity and scenario analysis, as well as how to build output tables that are key to any professional-grade LBO analysis. What is the current financing and valuation environment? What are key industry benchmarks? Circularity breaker and error trapping – no more DIV#0 and REF#! By the end, you will have mastered financial and valuation modeling and developed the core investment banking skill set that will give you a competitive edge in interviews and on the job. The Premium Package is designed for students and professionals pursuing careers in investment banking, private equity, corporate finance and equity research. You will follow along with the instructor step by step and build real financial models in Excel from scratch using actual case studies, current methodologies and best practices. It will give you an in-depth understanding of financial statement modeling, DCF, Comps, M&A and LBO modeling. This program pulls no punches — it is the exact same comprehensive training program top investment banks and financial institutions use to prepare analysts and associates for the desk. By the end, you will have mastered financial and valuation modeling and developed the core investment banking skill set that will give you a competitive edge in interviews and on the job. Wall Street Prep's Premium Package is used at top financial institutions and business schools. 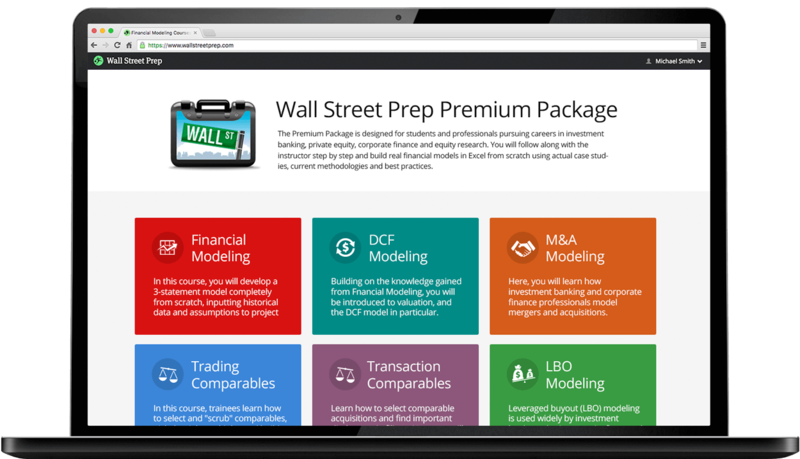 Wall Street Prep's Premium Package is intuitive and self-paced. You should expect to spend approximately 70-90 hours to complete it. Using a combination of videos, Excel model templates and financial reports, this course teaches students and professionals how to build, analyze, and interpret financial models in a step-by-step fashion at their own pace. The program utilizes a case study format, as students follow their tutorial guide alongside the Excel model templates, and are directed to the appropriate external documents (SEC filings, research reports, etc.) in order to build comprehensive models the way they would on the job. The Premium Package bridges the gap between academics and the real world to equip students with the practical financial skill set that they will need on the job. Our program will give you the confidence you need to ace your interviews and to get ahead in your IB career. Want a little extra attention? Live video-chat tutoring is available with experienced investment bankers for a fee of $199/hour. In addition, your tutoring sessions enable you and your tutor to share models, a virtual blackboard and any other files via an integrated web and phone platform that enhances the learning experience. In light of the challenges facing prospective job candidates, Wall Street Prep recently launched a free, voluntary opt-in service to all its alumni and new students. Upon enrolling in the Premium Package, you will be given the option to upload your resume and cover letter to WSP. Wall Street Prep provides its clients “lunch and learn” webinars on a variety of industry-specific and advanced topics that are of particular interest to investment banking, private equity and corporate finance professionals. As a Premium Package customer, you will gain access to all of these webinars, along with archived versions of past webinars. Premium Package enrollment includes a Financial and Valuation Modeling Certification Exam. You are eligible to take the exam for 24 months from the date of enrollment. Those who complete the exam and score above 70% will receive a Certification in Financial and Valuation Modeling. The exam is challenging and covers the most difficult concepts covered in the program. Learn More: Does Wall Street Prep’s Certification Matter? Very helpful. One of the most hands on online courses I have taken, and I have taken a lot! A lot of the content helped me with interviews I am currently undertaking. The premium package got me my job. After running through the financial statement and DCF modeling courses, I was able to masterfully walk through valuing a company. I have learned more from this program than I ever could have imagined, and the focus on practicality has truly prepared me for my new position. I have no doubt that if I hadn’t completed the courses ahead of my interview, my odds of receiving an offer would have been on far shakier ground. Thank you for creating such a useful and insightful course that cuts through complexity and simplifies seemingly difficult concepts. My main goal in getting the Premium Package was to learn how to build a 3 statement financial model. I have 6 years of professional experience in corporate finance but limited M&A exposure and wanted to learn to build models for potential acquisitions. I like the layout and the efficiency of the videos. It also helps to have the background on why each of the parts are modeled the way they are. The program is helping me be a more versatile contributor to the finance team I am on and allows FP&A to have more influence as we look at potential acquisition targets. I decided to take the WSP program because it was a recommendation from an analyst that I was working with. I think the course really wraps all detailed information of basic valuation knowledge with clear and hands on examples. Its really practical and concrete. At the moment I'm applying for IB jobs and it has already helped me pass first stage selection process given the modeling skills learned on DCF. I am currently an MBA student and I enrolled in the program to gain an advantage in IB interviews. I wanted something that supplements the core finance courses at my school, and that will increase my knowledge of the day to day content of an Associate role. I believe that the program will allow me to answer modelling-related interview questions much more confidently, and therefore allow me to stand out in the applicant pool. I have been working at an investment bank for over a year in a niche coverage group. My financial modeling exposure primarily involved working with preexisitng models. I wanted to refine my modeling skills before recuriting for the buyside. I chose WSP because of the prestige of the program. This is truly the best program on the street. This course has helped me get prepared for upcoming interviews and case studies that will assist me in launching a career in the buyside. Very clear and logical course curriculum with strong focus on accounting and modelling. Website layout is neat and easy to use. As a recent graduate, I purchased the WSP Premium Package to gain further in-depth knowledge in the financial modelling domain and to develop my applicable skills in today's dynamic work environment. WSP has taught me more than a university degree could ever do. Cutting through the complexity and eliminating the "fluff" from theoretical finance, it's highly advised for anyone looking to learn hands on. When I bought the Premium Package I was 6 months into starting my career as an investment banker. 75% of the time we use prebuilt models that pull information from so I wanted to really learn how to build financial models from the ground up to be able to compete in the job market when the time comes to move on. So far the course has been great. The presentation quality is top notch and the website/lessons are east to navigate. Secondly, I enjoy being able to access the course online so I can work on lessons from any computer. WSP has allowed me to advance my professional goals by allowing me to become competent in basic modeling concepts and understand where problems arise in models I build or prebuilt templates that I use on a daily basis. I purchased the Premium Package with the goal of learning some of the technical skills needed for a job in Investment Banking. I had conducted some research on my own but was also recommended that I take this course from notable firms on both the buy and sell side. When a VP at Point 72 told me that this course wasn’t just some random course in the internet and that he recommends taking it as all first year analysts at the firm have access to the course, I had made up my mind. Additionally a VP at JPM had similar advice. The course has been pretty helpful especially for my current role as an Investment Banking Fall Analyst. I honestly wish I had started this course earlier. My main goal when I purchased the Premium Package was to get the best Financial modeling course out there. I got it. It has what you need to know. I went back to get my MBA in finance but I have worked in finance before. I work full time and I go to school part-time. I do not have a lot of free time. I need to get what I want, when I want, and on whatever device I am currently using. The Premium Package has all of that. I get to take chunks out of each part I need to learn from with the little available time given to me. Enjoyable and practical! WSP is helping me show employers that I have the skills needed to do the job. It has helped me absorb important information from my core MBA courses that I would not get if I had not purchased this course. I've always been intrigued by modeling, but have never been taught the ins and outs of the process. I also want to beef up my excel knowledge. I recently graduated this May and am almost 2 months into my first job. So far I'm enjoying the content. It is helping me apply what I have learned in undergrad. I can see this course providing significant value later in my career. I purchased the Premium Package after I graduated from school mostly to learn LBO and M&A modeling as well as to fine tune my DCF and financial statement modeling skills. I like the course a lot. The videos are clear and easy to understand and the exercises are very useful. The Premium Package hit on all the areas of practice that I wanted to learn about. It's very straightforward and clearly explains the topics at hand. I've improved my skills in financial analysis and Excel for my current job and I've created a platform for myself to transition into equity research. This program boosted my confidence on technical aspects of modeling for future interviews, especially since I have no previous finance background. I just completed my MBA and did some financial modeling in the program, but I felt there were concepts that I did not understand or have the time during the MBA to go through more thoroughly. I love your course because it explains concepts with real life examples and it really helps me to understand the foundations of modeling. I can now confidently identify financial modeling as a skill of mine. I bought the Premium Package to get my feet wet with building financial models commonly used by the sell-side and buy-side. I graduated from BU undergrad 4 years ago and recently got my stock brokerage licenses. The course is comprehensive and complete. Many employers find it to be daunting task having to train new hires from the ground up, so I'm hoping this knowledge will help me land a job in the buy-side. I am about six months into my career as an investment banker and the bank I work for recommended this course. I enjoyed it a lot and I wish I had taken it sooner along with some other accounting courses. The program has helped get me up to speed quickly on all aspects of financial modeling. I am starting a career in Valuations & Financial Modeling for a Big Four firm in the next 30 days and I was hoping to brush up on my skills, learn industry best practices for building/formatting my models, and earn a certification that I could add to my resume. Additionally, I wanted to show up to work with the ability to prove that I could handle complicated projects. So far, I am enjoying the course. It is thorough and has provided adequate materials. It has given me a certification that is a "gold star" of sorts — showing at least a base level of skills to employers. Also, it shows initiative. My main goal was to further establish credibility with my ability to build financial models. I was at the end of my MBA and was seeking employment in a capital markets capacity. I found the course very well structured and easy to follow. The videos and supporting material was very good. Using a real company as the subject matter helped immensely. The course was instrumental in helping me secure a position in Equity Research. It helped me get a better understanding of the modeling that goes into an equity valuation. Good stuff! I am an upcoming Junior year finance student at Baylor University. I will be competing for an investment banking internship in the next month, so I thought this program would be a great way to differentiate myself. The courses have definitely been challenging, but I have learned so much from them. From understanding the theory behind what I am doing to navigating efficiently around excel, I already have a much deeper understanding. I am a sophomore finance student at the University of London. So far I have only good things to say about the course! The pace is perfect and the additional material provided is very easy to access and helps a ton in facilitating and accentuating the lessons. Being a college student, I dare even say that this course is better than the lecturers teaching in my school. The support I've received has also not let me down. I sent an E-mail with a tech support question and their team replied and solved my problem completely. I bought the Premium Package to learn the financial modeling required for investment banking and university case competitions which I wasn't taught in the classroom. I really like the courses. They are short, concise and straight to the point. Every effort is made to ensure that I fully understand the content. Furthermore, I like it how the lessons make me learn by doing, and it triggers far better recall than through pure inactive learning. As a Sophomore in college, I'm in the process of applying for investment banking internships. These courses have made me feel much more empowered and confident to be able to undergo stringent technical interviews. My home country is India and I have recently immigrated to Canada and I want to enter into the investment banking industry. I am a Chartered Accountant and I have about 2 years of experience in investment banking, project financing and have experience in building financial models. I have found the Premium Package really helpful. I appreciate the extreme detail in which the instructor explains the steps to build models. Additionally, the short length of the videos helps in studying even when I have just 20-30 minutes to spare. After having taken several accounting, valuation and finance executive courses at London Business School, I still did not feel confident in financial modeling, so I have been looking for ways to broaden my understanding specifically on valuation. Books for university courses take a lot of time to read through, and are not very interactive in case one has a question, which is why love the way the WSP online experience is set up. So far the courses have been very good! They have helped me in building and making an improved valuation model for my firm. I completed my MBA and I'm in the process of changing my career to mergers and acquisitions from a pure finance role. I've gone through the three statement modeling section and found it very valuable for areas in which I lacked experience. This program helped me to get an interview and an offer in M&A within weeks of starting it. I love it. Coming from a liberal arts collegiate background in a non-finance major (I study Applied Mathematics and Economics at Brown), I did not receive the extensive finance and accounting background that many college students receive before entering Investment Banking. WSP provided me the background I needed to prepare for interviews and start my internship in PE without feeling overwhelmed by seeing all new material. The course essentially provided me everything I needed to develop a solid base of accounting that I have continued to build off of. I thought the course was phenomenal! I enjoyed the Excel-based assignments, because those were the most applicable to the actual job (both for Investment Banking and Private Equity). I found the ability to download excel files in order to check my models very helpful, and I found the 3 statement, LBO and M&A models very comprehensive. I'm very happy with this purchase and I feel better prepared for buy-side interview modeling tests. Thank you for developing these courses! They're a strong compliment for my MBA (Finance) and a great modeling refresher. I am currently a final year undergraduate at the London School of Economics, looking to eventually break into the buy side. A main problem I found as a political science student is that the level of technical knowledge expected in PE/IB interviews was always more than what I learned in my university’s accounting class. This course will help bridge the knowledge gap I once faced. It was worth the purchase and I look forward to purchasing your other courses in the future as well. For the last 6 years, I've worked on power projects (we build, own, operate a power plant and get the revenue from sales of utilities). In my job, I often use a financial model which is made by FA., but I wanted to be able to make a financial model from scratch by myself (not just review what FA makes). I thought that would help me differentiate myself from others in the company and market. This course has been very helpful as I can learn from very basic (like formatting, excel shortcuts etc) to some advance modeling. It's helped me work more efficiently and I can make more organized models. I am a European graduate professional (MSc Finance in the UK) and I have started my first job in Real Estate Investments in Canada. My goal is to transition into a IB job in the near future (hopefully 1-2 years maximum). I have empirical and theoretical knowledge of the investment industry but I have never practiced in the real world. In the last 3 weeks I was able to complete half of the Financial Statement Modeling course. I'm finding it very comprehensive and I particularly appreciate the effort you put in explaining every single line of the excel files! My main goal was developing Wall Street ready skills to transition from the Buyside to the Dealside. A banker from a middle-market in Atlanta recommended WSP (they use the platform to train incoming analysts). It's been extremely helpful! The online courses are detailed, relevant, and paced perfectly. It has gotten me in the door with top firms on the street. Very useful! Excel shortcuts are so valuable and the modeling was a very good refresher to many things I have forgotten since college. I'm noticeably much faster and efficient. I’m a sophomore Finance student from NEU and I want to break into investment banking industry. Most of all I’m looking for summer analyst program. I would say taking courses on WSP was one of the best choice I’ve made. Thank you so much! It really helped me build up a framework on how to build a model from scratch. It will make me more confident in job interviews. I had two goals in mind when I enrolled in the Premium Package. First, to analyze my fathers business, create a business plan and subsequently a financial forecast that he could use to generate funding from a local bank. I’m throughly enjoying the course and I'm learning a lot! I don’t actually use a lot of these skills in my current position at work, but watching the videos and developing my understanding of how these models are built has certainly helped improve my knowledge on the financial industry as a whole and I’m sure that will benefit me later in my career. I just finished my junior year and secured a job in IB for this summer. I was not an absolute novice to the course material, but there are advanced topics in finance that can be a little esoteric and my main goal was to get a grasp on some of the accounting topics and considerations in M&A. I am a few videos away from finishing the M&A modeling, and I love it. I finally understood why every IB interviewer asked about what happens when depreciation is increased! Hopefully I will be able to apply much, if not all, that I have learned so far to my internship this summer. I am still working with some of the coursework but I'm generally quite impressed with the thoroughness and ease of understanding. In terms of comprehensiveness my research found WSP is the most advanced, and I've been very happy with the curriculum. I have about 8 years of experience in both financial analysis and risk analysis and my CFO recommended Wall Street Prep when I wanted to refresh/renew some financial teachings since the work world is much different than a classroom. I am very pleased with the self-taught process and ability to jump between lessons. A great resource! I'm about to begin my MBA at MIT Sloan and I'm using the Premium Package to get a hands-on understanding of Financial, DCF, and LBO Modeling before the recruiting season starts. The deciding factor in buying this course over others is that it is actually used in financial institutions. I believe (and certainly hope) this course will help me prepare to answer interview questions for IB recruiting, and allow me to be ready to start working since day 1. My main goal was to get a better all around understanding of modeling, particularly in LBO modeling before I move into PE. I'm currently a 2nd year analyst at a top bank. I chose this program it because a number of well-known investment banks used it as part of their analyst training. I have really enjoyed the course so far and look forward to finishing it, as I believe it will help me make the transition to PE. My main goal was to acquire additional modeling skills. I am a Senior Director, Finance so I don't have too many hands-on opportunities to build models. I've sent my team members to attend some of your public courses and they all expressed very high opinions. I really like the completeness of the course materials. I am a Brazilian senior consultant in management and financial operations and Valuation is part of my work offering. As PE is becoming popular in Brazil, I wanted to get more familiarized with LBO modeling. Your program is quite good and fulfilled my expectations! My goal is to transition into investment finance and I need to acquire/validate 2 of the foundational skills that would serve in this new career: modeling and valuation. I am 110% satisfied by the content and by what I’ve seen so far. I like the approach of “just jump in” and develop the financial statement models. I value the self-paced schedule as I need this flexibility within my professional life.The course has also helped me precisely delineate what I want to do in terms of career. I know now that I want to focus on small to medium companies, in the renewable energy sector and either agro industry or light manufacturing. Thank you for a great service/package! I just graduated from Purdue University and I'm trying to get my feet under me as a financial analyst for a couple years before sliding over into a boutique PE firm. I'm very pleased with the overall course! My friend has a similar program through "breaking into wallstreet," but I chose the Premium Package because WSP brand carries more weight with PE firms. I spent two years as an associate in the real estate IBD at Goldman Sachs, and I'm now looking at more generalist PE shops. As such, I wanted a refresher on LBO models and valuation for other types of companies. The WSP package had everything I wanted — LBO, transaction comps, three-statement modeling. While $499 isn't cheap, I thought it seemed worth it compared to some real estate courses I have seen that run around $800 without the same amount of information. It has really boosted my confidence! I bought the Premium Package to compliment my expertise as an excel consultant for Thomson Reuters - specifically for the purposes of building custom excel solutions. Your material is well put together and digestible. I really like the 5-15 minute videos — they are long enough to cover advanced modeling concepts but short enough to let me focus on other tasks throughout my work day. I'm currently an analyst with one year of experience, transitioning jobs in a new city. I bought the Premium Package to hone and refresh my knowledge of the fundamentals of financial modeling to assist me in my interview process as well as future job performance. This course has helped me to build the confidence that I'm on a level playing field as those from target schools. I enrolled in the Premium Package because I was taught financial statement analysis by a CFA who did a great job of explaining the concepts, but not so much the models. If I would have known what I know now from this course about building models, I would have gotten so much more out of that class! I am an undergrad currently finishing my second year and preparing for difficult IB internship interviews, so I wanted a better understanding of the valuation methods used in the industry. The program, unlike my school, actually teaches me useful information that I will use in a career path I am interested in pursuing. The lessons in the Premium Package are very easy to follow, straight to the point, and I would recommend it to others in my shoes trying to get into industry. I have just begun using the Premium Package and have completed the Excel basics and begun DCF analysis. I am an MBA student graduating May 2018 and looking to transition into a finance career from Information Technology. I'm looking to gain additional knowledge and a certification to aid my job search and enhance my skill sets and I am positive that these courses will be of great help for me. My main goal for this course was to refine my modeling skills. I am in my second year doing Business Valuation for a big four firm. I was pulled away to work on a project that did not entail modeling so I wanted to take this course to “get back in the game." I chose WSP base on recommendations from friends and colleagues. Everyone I talked to spoke very highly of this course. It did not disappoint! This course was all I was looking for, and more. It was very detailed and made me feel like I hadn’t skipped a beat. It made me feel much more comfortable going back to working with financial models every day. I am a college sophomore and I enrolled to get better in financial modeling, case competitions and stock pitches. I'm currently going through the Premium Package and I'm already feeling more confident during cases. The video demos are definitely helpful for anything done on Excel. I'm going to apply for financial analyst roles in the buy side/sell side industry and I wanted to acquire more confidence in those areas of expertise. I also wanted a recognized certificate to be able to signal recruiters my knowledge. The course is great so far! It gave me a sound and solid framework around the topics I had previously studied and provided valuable insights and depth into specific areas of financial modeling and valuation. Also I find the lifetime access very important. I have been an analyst on the buy side for 7 years and may be transitioning to a new role where I will need to do more modeling from scratch, so I wanted a refresher on best practices and efficient model building. Your videos are very easy to follow and the ability to download files to use offline is really helpful. I enrolled to learn modeling skills taught by people with industry experience rather than the academics at my school (I'm in 4th year). I want to be able to include a model with my application package to make me a more compelling candidate. The course was really helpful -- I liked the download feature so I could watch them on the train into work. Having the models is good so I can modify them for equities I'm interested in. I can already handle the technical component a bit better in interviews/meeting for coffees. I was transitioning from consulting to private equity and wanted to brush up on financial modeling before starting. This course is incredibly practical and well-paced! My main goal of purchasing this course was to tune my financial modeling skills as I recently accepted an investment banking position as a first year analyst. I am a recent college graduate with 10 months of working in the financial industry. I did some research on various courses - Wall Street Prep stood out to me for a) positive reviews and b) easy to navigate interface that was transparent and intuitive. The Financial Statement Modeling and Discounted Cash Flow sections have been great! Both courses have had a material impact on my knowledge of financial modeling and have given me a new depth of financial knowledge. I purchased the Premium Package to enhance my excel skills and provide evidence of my interest in financial statement modeling on my Resume. I chose WSP over other providers because of word-of-mouth and recommendations from others who took the course. I find the overall direction of the course to be very helpful. Not only do you learn how to use a FS and other models to help with financial analysis, but you also learn how to craft your own. In addition, it is useful to learn more about industry standards for models. I am hoping to use my new skills when interviewing for jobs as a financial analyst. I am a professional with 10+ yrs experience working in finance but wanted to gain some additional skills to further my education and make my day to day work life more effective. I chose Wall Street Prep over other training providers because of their value for money, reputation and the learning skills they offered that I was interested in. I LOVE IT!! I am still working my way through, but find it very easy to follow along and I am enjoying working my way through the material. The models you make are more organized and have a nicer logic than other training providers. The short lessons and organization is also a plus over the competition’s longer ones. The courses are great! I think it’s the best way to learn how to model by far. I got tired of having to study books that are too a academic for the real life and not being able to interact with the content I’m trying to learn. WSP changed that. I wouldn’t succeeded in job interviews if it weren’t for WSP. I think the Premium Package is really helping me to learn more and more about financial analysis. In my opinion, this course is a must for finance students. I purchased the Premium Package to achieve a better understanding of how to analyze a company through their financial statements and to better gauge how to forecast future performance for preferable personal investing decisions. I believe the skills learned from completing the program will definitely help me handle situations I will be presented throughout my career in finance. I was in the middle of a recruitment process from a boutique investment bank that specializes on infrastructure. I was told I would have to make a small valuation case, so I decided to buy this course to prepare properly for it. I have just received an offer from a bank I was interviewing for and most likely will get another from the IB Boutique I mentioned above, so the courses have proved to be very helpful! The course is amazing and I love it! I have completed the financial statement modeling course and found it very useful! I especially like that it goes into describing the logical drivers for each forecast line item and what the market standard approach is. The course has also helped me to better understand the models I review from the likes of Bank of America Merrill Lynch and JP Morgan. The course is helping me to gain the capabilities needed to transition from a legal background into the finance aspects of business. I am very impressed with the content, the smooth transition from topic to topic and with the overall quality of the course. I can confidently say that I learned a lot of new topics and tips that accelerated my comprehension of various finance topics. I am confidant that the course will exceed my expectations based on the material that I've covered so far. I recently graduated from London Business School and wanted to further enhance my modeling skills. I had less than a year of investment banking experience and wanted to get a head start with regards to modeling before my job started. I highly recommend the Premium Package. It contains everything you need to kickstart a career in investment banking. I am now much more confident in modeling thanks to WSP. I am currently a sophomore at Colorado State University and hoping to get in to Investment Banking once I complete undergrad. I love all the material you have over every course — it is very well put together! This will be an excellent way to get ahead of the curve and have a solid knowledge base that many others will not. I purchased the Premium Package because I worked for a Private Equity and now doing my mba. I didn’t want to lose touch of modelling since for interviews they ask you to make a model. Good reviews and faculty were key factors in choosing WSP over other providers. The webinars are also really good. The course is really helpful. I’ve learnt things I didn’t know before. My main goal was to diversify my skill set and add some validity to a notion I assert, which is the ability to perform financial modeling. I chose WSP over Breaking Into Wall Street based on YouTube lecture samples that appeared superior. Furthermore, WSP instructor(s) and program has a better resume. Great course - no complaints and worth the investment thus far. The program has added another tool to call upon if ever needed, and picking up a few Excel tricks never hurts. My main goal when I purchased the Premium Package is to prepare myself for the career path in investment banking/ corporate finance in future. Currently I am a MBA student. I decided to choose WSP because based on my research, WSP has better reviews from the learners and more recognized than other similar courses. I think the course is good and it will provide a solid foundation for people who want to pursue career in investment banking sector. The program is relevant for my career path in investment banking/ corporate finance. I believe it will enhance the chance for me to get the job that I want after my graduation. My main goal in buying the Premium Package is to gain the technical skills needed to analyze acquisitions and other investment opportunities in order to leverage my industry knowledge within the media industry to further the growth opportunities in my career. The deciding factors in choosing WSP over other courses were that WSP had great reviews and the other options I was considering did not have the LBO class in their premium package, and no test at the end of the class. The course is great. Not only does it teach the technical skills of modeling information in excel, but also shares where to source the much needed data to build models. My main goal was to get a clear understanding on financial statement modelling and get as much practical working knowledge as I can get from an online self study course. I did my due diligence before I purchased the course, the positive reviews on the internet and comparative advantage over items covered in the premium package also lifetime online access were the critical decision making points for me. I also went through couple of free sample lessons to check the quality of voice recording and presentation skills - I've to say the value received was pretty amazing. Personally I think the premium package along with the accounting and excel crash course I bought seems excellent value for money. It flows through from the beginning to the end, chapter by chapter so it is very easy to follow. I believe It'll certainly help to achieve my career to goal to work in a private equity house after successful completion of my MBA in 2020. I am a long term CFO for medium sized businesses and the last 2 years I have been a Consultant CFO. I enrolled in the Premium Package because even though I have been doing financial modelling for many years I wanted to ensure that I was employing ‘best practice’ and ensure I was completely up to date with current trends. I read a bit about other providers but I came back to WSP because the comments of others reinforced my aims. Also I thought the price was competitive (but this was not the determining factor). I can say that my expectations have been more than met in every way. I have really enjoyed the course so far. I really like the format of the course as it is structured into small learning points which suits me perfectly. I rarely get the opportunity (and don’t want) to spend 2 – 3 hours on one module. The module size fits my busy life style exactly. As a result I actually look forward to doing each module. I find the teaching methodology fantastic – it is clear, concise and you feel that you are being instructed by someone who really knows the subject. I will definitely be using the Formatting Conventions, Modelling Best Practices and Model Structure for all my future modelling and encouraging all my clients to use the same best practices. I highly recommend this course. My main goal was to learn financial modeling skills in order to change careers to investment banking or consulting. It is an essential skill that is not easily learned in school or in my current work. I chose WSP because it had the best reviews, I talked to friends of friends that used it and recommended it. I also like that you added the consulting package, even though I did not have the option at the time I purchased. It seemed like the most complete option. I think the course is great, breaks down well, and it’s easy to pace my self with my busy schedule. I purchased the Premium Package because I was in my 1st year of career looking to solidify modeling skills and advanced accounting topics. I chose WSP because it has the best reputation for interactive online materials (prefer this to just buying text book like materials). I thought the LBO course was great. The program has given me great confidence at work and allowed me to get ahead of my peers. I am currently enrolled in CFA program, so I wanted to supplement its curriculum with excel mechanics. I chose WSP over Breaking into WS because it was more widely viewed as a standard. Even though both programs are quite similar, WSP seemed to be more recognized among practitioners. Overall, I am satisfied with the course. The material is very relevant to what I do day-to-day. I am glad I made the decision to sign up and I will definitely recommend to others. After being in solar project/real estate development post-MBA, I thought to brush up on my 3-statements modeling as I attempt to transition into a corporate FP&A role. I chose WSP over other training providers because of the price vs what I get. I also like that WSP was recommended by CFA-SF. I think the course is great! It's just right amount educational without getting too into the weeds. I like that I can adjust the speed and speed through the parts I'm familiar with. I'm more confident in building a 3-statements model and learned a few shortcuts that help me build a model more efficiently. I regret not taking this course while I was in business school. My main goal in purchasing the premium package was to help develop myself in fundamental analysis, financial modeling and valuations as well as enhance my resume as I prepare for a career shift in finance after graduating with an MBA in Finance. The deciding factors for choosing WSP was that more companies value the training provided by WSP. Also several of my classmates told me the course was extremely helpful for them and so far the course has been extremely helpful for me as well. My goal is to understand financial modeling to use when I found my own company. I chose WSP over other training providers because the price and discount for the bundle (a lot of knowledge for few bucks) and a review in wall street oasis that compares the best online training providers. The info I've learned from the program is essential for my new company. I'm from the tech world and it's very important to me have a better understanding of finance and fundamental analysis. I decided to take the premium package to bolster resume in hopes of breaking into investment banking. I chose Wall Street Prep because it is a recognized name by investment banks and on a recommendation from an investment banker. I love the course. Hopefully it will make my resume stand out. I am an associate at an early stage PE/VC firm, and I bought the course because I was looking to sharpen financial modeling skills for work. I chose WSP because of the price and good feedback from internet discussion boards and peers. The scope is also comprehensive. The course has been helpful and straightforward so far. It has helped me build confidence in financial modeling skills that can help me at work or for future interviews. It has allowed me to see areas that I had not considered before in my study of financial modeling and financial analysis. My main goal when I purchased the Premium Package was to get a refresher on financial statement analysis and modeling. I was an economics major in undergrad, so I had a baseline understanding of dealing with financial statements, but as I prepare to matriculate into the UCLA – Anderson MBA program this summer, I wanted to refresh that knowledge and build on it prior to beginning my education. WSP came highly recommended from a mentor, a HBS student and WSP customer himself. The course has been great so far, really going into detail on all the different aspects of financial statements, how they interact, and how a combination of different sources can be used to analyze and build future valuations. I feel much more confident as I move forward into beginning my MBA having used WSP, and am excited to apply my newfound knowledge both in the classroom and beyond in my future career. My primary goal in purchasing the premium package was a desire to acquire an in depth understanding of modelling. I’m currently employed at a Big 4 accounting firm in audit however, I’m looking at the possibility of moving into investment banking and need to bridge the modelling gap. While online research pointed me towards WSP, the primary deciding factor was my discussions with a current mentor and IBD professional. His firm utilizes WSP as there modelling course for new graduates. This industry validation, and the potential to include the course assessment on my resume, were the deciding factors. I've been impressed by both the materials and delivery of the content. This will help bridge the modelling gap required to potentially move to IBD or PE. In addition, it has already helped in my current role. My main goal in purchasing the premium package was to fill a gap in what I know is essential knowledge for my desired move into private equity. I have been a broker for about 6 years, and supervise an options trading team at a large financial institution. Currently I am pursuing my MBA at Texas Christian University while working. Since I could not fit into my work schedule classes that cover financial modeling in depth, I knew I needed to be proactive and do this on my own time. I chose WSP after speaking with several peers, and was also influenced by the fact that you all come and do workshops at TCU occasionally, so it was a familiar name to me, given legitimacy by the above workshops done for my MBA peers. So far, I think it is great. The detailed explanations on everything from rationale for doing certain things to formatting is exactly what I was looking for. Looking forward to continuing to make my way through the courses. I am certain that my confidence level in this topic will be drastically increased. What was my main goal when I bought the Premium Package was to improve my modelling skills via a structured course and set of principles. While I have modelled in the past I have never had any form of formal training. I am a qualified accountant that has recently moved in to a Consulting role. The accessibility of the course online and the reputation that WSP has for providing a good foundation in financial modelling made me choose WSP over other training providers. I think the course is excellent. I feel it will aid me in the short term on a number of upcoming assignments and hopefully in my career. The premium package has allowed me to build a solid foundation of practical knowledge that has been extremely helpful in the job search process. I am very happy choosing the Wall Street Prep course. I was looking to get more familiar with the wide range of modeling tasks I was given in my first-year investment banking job that I started in June 2017 — everything from simple three-statement models to much more complex LBOs, and to prepare myself for the upcoming private equity recruiting season in which building LBOs from scratch is a critical component of the interview. WSP courses seemed to be the most succinctly organized yet also the most comprehensive. Other courses I looked at were either too lengthy or too circuitous in their topic material. I haven't completed the entire course yet (mostly focused on LBO modeling component), but what I've covered so far has been both thorough and properly paced. I look forward to engaging with the rest of the modules. I've had several PE interviews thus far and have done well on the modeling tests, and at work itself the modeling tasks have become much less imposing as I've firmed up my technical foundations through this program. My goal was to improve my modeling efficiency and pick up some new tricks. Academic models don't cut it, and it can take a long time to catch up with the learning curve with on the job learning. The course is great so far. I have picked up a lot of time saving tips, and just helps deconstruct some complex models I have been working with. The program has helped me greatly improve the speed and efficiency of working with any model, as well as giving me a leg up on my peers, which is nice since bonus time is around the corner. My main goal was to gain a deep understanding on company valuation and follow a good methodology. I'm currently looking for new job opportunities after 8-10 years of experience and want to re-enforce my knowledge in finance and accounting to remain competitive. So far, it's been outstanding. Due to my background in finance, I already had some knowledge but will apply a better methodology for company valuation. I also appreciated that the session speaker went through excel shortcuts as it's been very useful. The WSP courses had been a really great refresher to some topics I had learned in university and has been a great introduction to many topics that are relevant in the finance profession. I recently graduated with a major in finance and a full-scholarship from the Dominican Government to complete my studies in Mexico at Tecnologico de Monterrey. I wanted to upgrade my knowledge in order to fit and add more value to some IB firms I was applying to. It is an awesome course that helped me to find a good paying job in IB, which has helping me to support my family back in Dominican Republic :). This course helped me to level up and outperform almost all of my peers at my university. I'm at a long-short fund, and training is difficult to come by given resources available in-house, so I joined WSP. Very good program! It made me more comfortable modeling and allowed me to move more into equities. I'm a senior analyst in a corporate advisory firm in Melbourne. I chose WSP because it appeared to be the most highly regarded among the big financial institutions and came highly recommended by past users. I like the fact the Corality/Mazars uses WSP for delivery of online content, as our firm engages Corality to for quite a lot of our in-house training, so I am hoping there will be some shared methodologies between the two providers. I enjoyed the mode of delivery and style of instruction. I like the video tutorials and the website design is intuitive and easy to navigate. WSP has the best presentation. In fact, several other providers tried to show their value by comparing to this program, which tells me it's the standard. It was also a good value; lots of material and broad coverage for a modest price. My goal in buying the program was to secure a full-time investment banking position, which I have succeeded in doing. Extremely helpful! I bought the Premium Package to get a good introduction to M&A and LBO modeling. So far it's been really great. I have a better understanding of the processes in M&A and the theory in valuation and LBO. The fact that I can go back and re watch the videos if I need a brush up is really great! I am a small business owner/entrepreneur who enrolled in the Premium Package while I was looking into an acquisition of a company. I wanted to brush up valuation and have some templates to expedite the modeling process, and your courses definitely helped me in analyzing and modeling my deal. I am 18 months into my first job as an analyst with a healthcare-focused PE fund. All of the training I have received was from my superiors and is sufficient for what I do, but I wanted to further round out my skills. These courses have bolstered my skills and will help me better tackle unique issues that we find with the different deals that we look at. I think having done the course will also be helpful in future job interviews so employers can "check the box" that I have more formalized modeling training. Great program! After I took the courses, my company purchased the Premium Package for four other individuals. I enrolled in the Premium Package because I was getting curious about later stage investments and M&A and I found out my company had previously purchased training from WSP. That was the differentiating "seal of approval" between you and other providers. I loved the program — is well thought out, thorough, and easy to follow! The lessons are very clear presented in an appealing way. The price is well worth the density and quality of courses and learning materials. When modeling, the biggest issue I faced is that I tend to be locked into one approach — your courses have solved this be letting me step back and take in a whole new perspective on modeling. And all the Excel tips are also extremely valuable! I'm a senior in college with little to no financial modeling experience. I chose Wall Street Prep because I did not want to wait for an in-person certification course. I really liked the presentation of the materials and the fact that I could get certified online. I wanted to get certified in time for the technical questions for interviews at banks, and not all of the other online courses offered that. I like the layout, interface, free webinars, and I think the lectures are very informative. It is exactly what I was hoping for in an online modeling course. The material is very well organized and certainly keeps my attention and interest. I like that it presented casually as if I was listing to a teacher in a classroom or if I had someone explaining it to me personally. All topics are presented very thoroughly, and I am looking forward to getting to the heart of valuation. I am really enjoying the course! The coursework provides in-depth explanations of the inputs and outputs and how to utilize the information to make decisions. I found that WSP was significantly better in terms of recognition by professionals and has a user-friendly interface. The nearest competitors do not even come close regarding the organization of course materials. This program is helpful in developing skills that are really useful within work, investment clubs, competitions, etc. I also find that it provides a solid foundation from which I can mention material in networking and approach professors to research about. I do not think any course does as good as a job as WSP in regards to getting students quickly up to speed. The videos are shorter in length and get right to the point. Additionally, they manage to somehow cover every topic/issue I can think of in that time frame. I feel that it has made me desk ready for when I start full-time. I feel confident that I have a strong grasp on all concepts and pleased that I have a reference to fall back upon should I need to look something up. I enjoy how the modules are broken into clips and are fragmented into exercises. It makes it easy to fit into my schedule and easy to refer back to parts that I would like to spend more time emphasizing. The question forum and is very interactive. I do believe that this course will set me up for a smoother transition from student to practitioner. The materials that are being covered in the premium package together with all the extra added videos exceeded my expectations. I also found that using real company examples proved to be very helpful. I've taken several other courses and, by far, this is the best course I've taken. It's not even close. The self pace videos give me a chance to practice and review areas that I either didn't catch, or didn't understand fully in a live session. I feel that the program definitely gives me the confidence to go into an interview with my head held up high. The course made me feel much more comfortable navigating Excel, financial statements and financial models. I appreciated that in going through the models, no stone was left un-turned, ensuring that as I went through the course, every aspect of the model made sense. Unlike some one-day courses that don’t allow you to go back and really understand what is going on, the online videos and course materials were excellent for really understanding the details of how a model works. I now feel confident undertaking models for anyone that asks. I am currently a senior in college pursing a summer analyst or full-time investment banking role. My main goal for buying the Premium Package was to gain technical knowledge so that I can stand out from the top competition. The instructor is very clear and explains the concepts in a way that is easy to follow and understand. I had very little real world experience modeling in Excel, but knowing that I will be using Excel on a daily basis this summer, I wanted to increase my knowledge of the software. This course has set me up for success during my corporate finance internship by deepening my understanding of finance, excel and how investment bankers communicate and think. With this knowledge, I have no doubt I will be able to achieve my professional goals. I have been working in the finance industry for four years. I want to move into investment banking or a valuation role for investment banking and that was my main goal for taking the premium training program. The material is structured in logical sequence in such a way that one concept leads nicely to the other and keeps things interesting. I love the Excel shortcuts and tricks that are taught along the way as well. My goal was to become more competitive, specifically to set myself apart from candidates applying to the same roles I was. I am currently in the first year of my MBA, the Premium Package helped me learn accounting and finance quickly and easily. The course pace is perfect, starting off with "simple" modelling best practices before getting deep into the mud. I have a lot more confidence now in interviewing for jobs that require financial modelling skills. It will certainly help me move up the ranks together with the existing finance skills I possess. I first purchased the Premium Package due to the breadth of use of the program across respected firms in the finance industry. Not having an investment banking analyst background, this program was the perfect way to bridge the gap in technical skills I missed out on while working in corporate finance, especially because I knew my IB peers had received their training from Wall Street Prep. I was able to use the Premium Package as a data point in multiple interviews to show why I was capable of switching from a corporate finance group to a portfolio management group within the same company. The interviewers were impressed with my initiative to grow my technical skill set, particular relating to the LBO knowledge within the Premium Package. 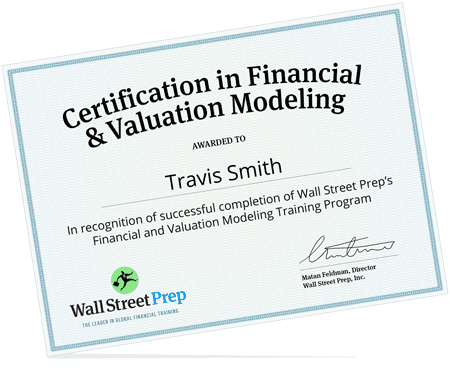 I purchased the Premium Package to gain a deeper knowledge of advanced financial modeling and to learn how to build comprehensive models for valuations. I loved the step-by-step approach and the way the lessons were segmented. I now have a much deeper understanding of finance as a whole. The Premium Package lessons are clear, well-structured and I love the step by step progression. I found it very easy to understand. Thanks to this training, I'm able to build my own models and perform better in my job. I also consider these skills necessary to make my way to a global IB or PE group. WSP stood out to me because of its reputation, professionalism and the material covered. The Premium Package is a great educational tool in all senses. It breaks apart from traditional education by giving hands-on, practical and well-taught material. After working through the program, I feel my knowledge and skill-base has drastically improved. I purchased the Premium Package to gain greater exposure and understanding of the modeling process. The material is broken down into manageable segments with supporting documents corresponding to each lesson. It was very easy to work through the material at my own pace. The skills I have gained will allow me to take on a broader range of projects as well as further develop my financial skills. I purchased the Premium Package to help prepare for the technical aspects of upcoming interviews. I really liked the short lectures, breaking it up into 10 to 20 minute blocks helped me to stay focused. I also liked how it constantly tracks how far you've gone through the course, that really helped me to feel like I was making progress. I purchased the Premium Package to get actual experience with modeling. I chose WSP after seeing how many companies have utilized WSP’s courses to help train their employees. I liked that you can go at your own pace, starting with the basics and working your way up. I can now say that I have modeling skills and can articulate key modeling concepts. The Premium Package has helped me develop an advanced skill set on excel, sharpen my skills on FSM and expand into other more complicated models. Having the videos at your own pace is great, it allows you to work at your own rate and fit the work into your schedule. I valued the flexibility of the online program as well as ability to control the pace. My MBA was very good about teaching the theoretical, but this course has been very helpful in teaching what is practical. The combination of theory and case studies was very good and helped me understand the content quite fast. The tutorial videos are very useful during the learning experience. Working through the Premium Package has made be more confident in regards to upcoming interviews. I was searching for a self-paced course, with unlimited access to materials, with a concise and effective teaching method. I found that the materials were on point with a good mix of teaching and self-practice. Excellent support with any questions I had along the way. My main goal when buying the program was to develop the knowledge that I had acquired at McGill further, and learn how to perform valuation in a more professional way. I know that what I am learning right now through the Premium Package will be covered in my future interviews, and being comfortable with the various accounting and valuation concepts taught in the premium package is definitely required if you are looking for an internship or full-time position in investment banking. The premium package is a great real life application compared to the CFA which is more academia based. I really enjoyed the fact that the advanced concepts were broken down into short videos. I am a senior in college preparing to start a full time job in investment banking. I bought the program to learn more about the practical side of finance and improve my modeling skills through an avenue that would give me the opportunity to practice modeling. The Premium Package is clear, orderly and allowed me to work at my own pace. The Premium Package is a very professional course, and WSP is a much more recognized brand than anything else out there. The courses start off simple and move on to more intensive topics, and the certification at the end is a nice add on. I recently completed the 3rd level of the CFA program and was looking for a course that would blend financial theory with real world practice. With leading banks using WSP as a part of their internal training, I was confident it would be a valuable, highly respected program. I am pleased with the blend of slides and hands-on spreadsheet modeling. The instructor is excellent at keeping the material compelling. I couldn't be happier with the Premium Package, I've learned so much and the support was fantastic. The structure is logical and extremely well taught. My goal was to learn how to model like the professionals and to help me break into the investment side of the industry from a research background. After being in the workforce for 2.5 years, I am working on a career change to Investment banking or Corporate Finance. The video/excel combo that the Premium Package offers is great, it’s the perfect way to structure the courses. I’ve been extremely pleased with the program and find myself more knowledgeable about how to asses economic value/profit and create financial models. I am a corporate finance analyst at a Big Four firm and wanted to be able to face models with complex targets and to know specific topics such as deferred tax assets and liabilities, dilution of shares, LBOs, etc. I found the course to be perfectly structured! I graduated with a degree in engineering but wanted to transition into finance. I found the pre-prepared spreadsheets were great to work with and all the supplementary material in general was very well organized, allowing me to easily follow the lessons and learn financial modeling. The most effective part of the course in my opinion was how the different modules were structured. I appreciated how each individual video covered by and large only one topic and rarely lasted longer than 15 minutes. This made the topics appear much more digestible. I was ultimately able to get an internship in P.E. These videos helped give me the confidence I needed to get through my interviews. The material is communicated very concisely, there is no fluff or useless information, and I found that to be very helpful. Additionally, the presentation of the material is done in a very logical, step-by-step structure. I interviewed for an analyst position and the technical skills I learned from the WSP premium package proved invaluable during the interview. My interviewers were impressed, and I largely attribute that to studying the WSP premium package videos. The Premium Package allowed me to gain a better understanding of Excel modeling, M&A processes, investment banking, and the numerous topics covered in the webinars. It was a great experience because I am more of a hands-on learner as opposed to a classroom settings. I loved having the PDF files along with Excel templates to walk through the program at my own speed. I now consider myself an Excel guru and I absolutely love it! This program allowed me to apply the finance and accounting basics I learned in college to real world and on the job scenarios. The Premium Package helped me increase my understanding of how basic finance and accounting principles are used on the job. It also helped increase my knowledge about the interview process, which was important for me in this stage of my career. The course is giving me a lot of insight into how to look at financial statements from an investment perspective and into the activities IBs do on the job.Since I come from a non-target school without a degree focused on finance, I believe I needed a deeper-than-average knowledge of financial modeling for an entry role. I liked the ability to be able to download/stream the step by step videos on the road, as I travel around various countries each week. The courses were structured seamlessly. The workflow that dipped into accounting theory and presentations was very well done, as it set the context before jumping into the meat of the model. I would recommend the Premium Package to anyone. I first went through a few free courses you offer, as well as some free courses offered through other providers. WSP courses are just easier to understand, don't come across in a monotonous voice, and are completely video based, not just text-based. The course structure is great, the breakdown of topics and the quick run-through on what's happening before actually modeling helped solidify the material and drive in the factors happening behind the scenes. Having modeling experience is a definite plus and always looks good on a resume! I'm currently a junior at Northwestern and my main goal when I bought the Premium Package was to prepare for investment banking interviews and internships and to have an advantage over other interns. I chose WSP based off recommendations from professionals in the industry and talking to other students who interned at investment banks. I really like the online instruction complemented by the PDF and the exercises —it is like a regular classroom setting and I really like that. So far, I feel much more prepared for interviews and feel capable of working out a couple models on my own.